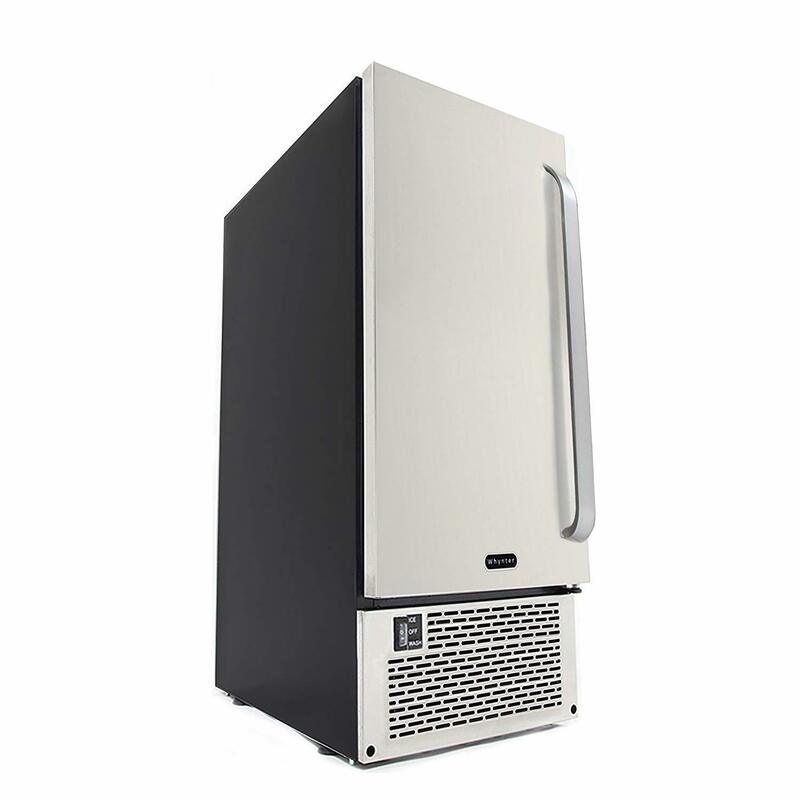 When you are looking for an ice maker for a restaurant, bar or office, there are two important factors to consider. The Whynter UIM-502SS meets ​both of these needs perfectly. This Undercounter ice maker has an ice production capacity of 50 lbs per day and it makes clear gourmet ice cubes. This Whynter also costs less than $1,000 on Amazon, which is a surprise considering the capacity and ice quality. But you’ll need to spend a bit extra on a plumber to install it. Overall, the Whynter UIM-502SS is one of the best undercounter clear ice makers and an excellent value. 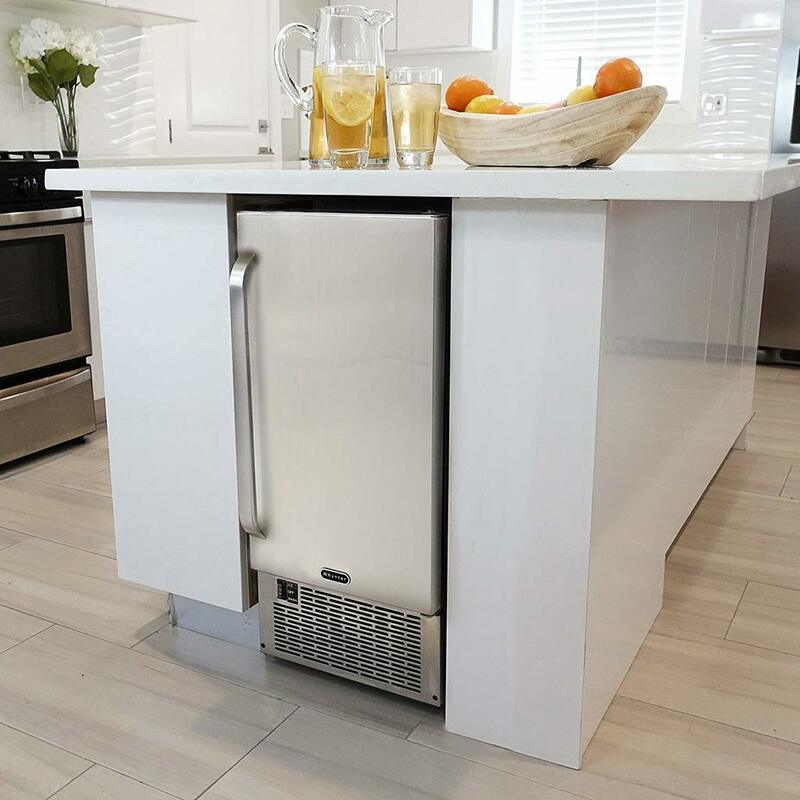 If this is is not what you are looking for, then check out my other top recommendations in my recently-updated undercounter ice maker buying guide. You may be tempted to buy a compact portable ice maker ​- they are very cheap, and you can even get one that makes clear ice cubes. But for restaurants, bars or any other place with high ice demand you need a more capable & reliable ice maker. 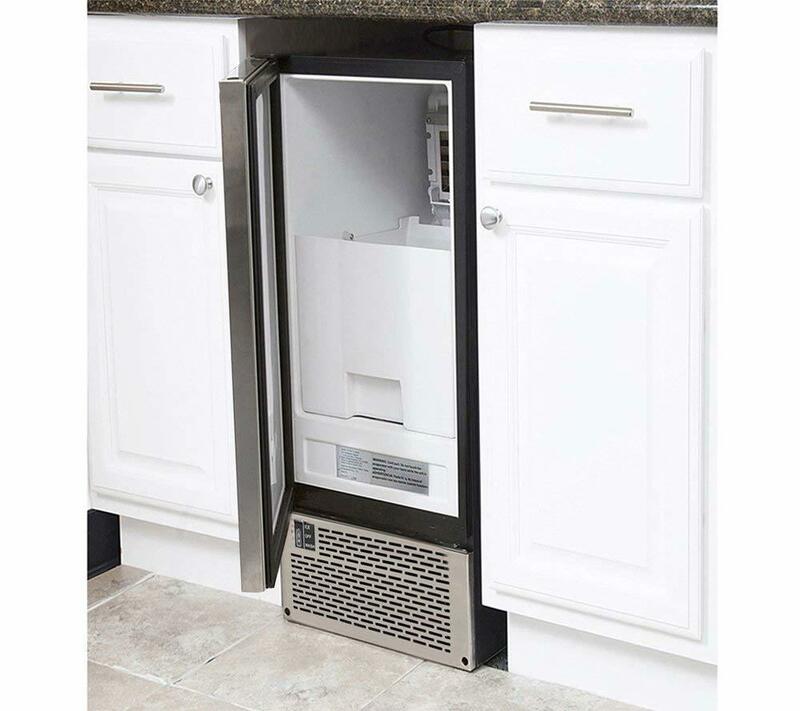 I highly recommend this Whynter UIM-502SS undercounter clear ice maker. 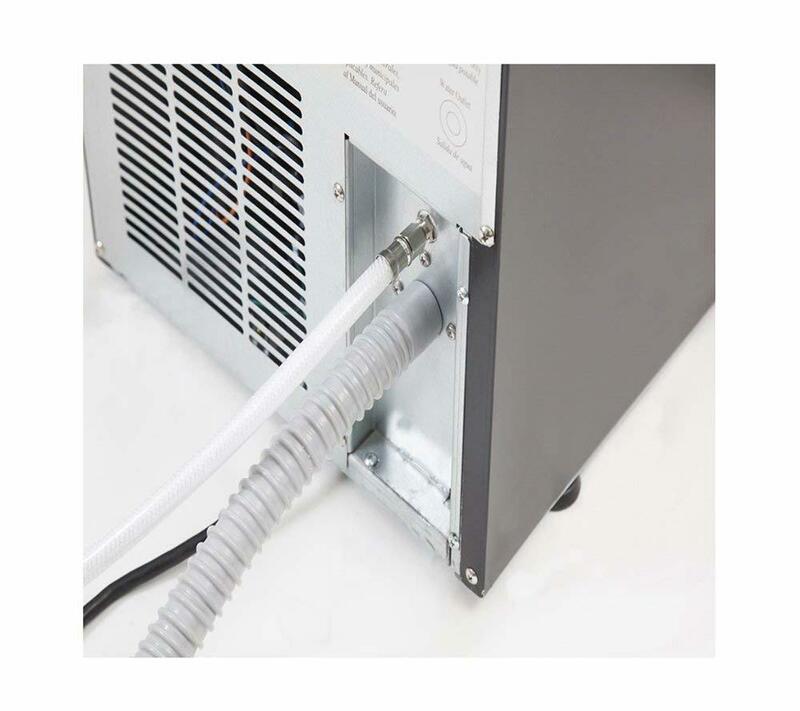 The 502SS is designed to be a commercial ice maker, which means it’s more durable and makes high quality ice. It also makes ice very quickly, which will come in handy when you have a bar-full of customers who need a steady flow of chilled drinks. Aesthetically this ice maker looks great. The stainless steel door and black cabinet will blend in well in any bar, restaurant, kitchen or office. Because the door is reversible, you can install it to swing from either side. You also have the option to install it undercounter (it has front-facing vents) or leave it freestanding. Just make sure you set up the line-in and drain correctly. I highly recommend hiring a licensed plumber to install it for you. With a 50 lbs of daily ice production capacity, the Whynter UIM-502SS is roughly in the same range as other undercounter ice makers. It’s enough for most small restaurants, bars, kitchens and offices. It’s also a good choice for home bars. If you have a larger establishment, consider other larger gourmet ice makers. Some good ones include the Scotsman Prodigy (85lbs) and the Scotsman CU50GA-1A (65lbs). 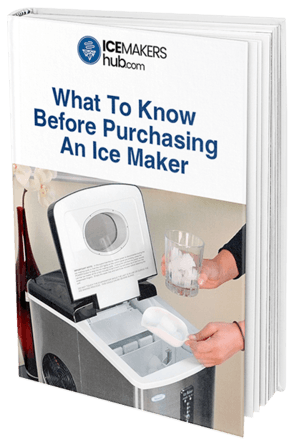 See our clear ice makers buying guide for other alternatives. The 502SS' storage bin can store up to 25 lbs of ice. But you don’t have to wait until it fills up. As soon as you turn it on, it starts dropping ice cubes into the bin after just a few minutes. Note that, like most other undercounter units, the bin is not refrigerated. It’s insulated to keep ice frozen for some time, but if you leave it in there for too long, it will melt. This ice machine produces clear gourmet ice which suitable for restaurants and bars. The ice cubes are very hard and much denser than normal cubes from a freezer. These melt very slowly in drinks, making them perfect for premium drinks that you don’t want to be diluted. They also look elegant in a glass. Unfortunately, you cannot adjust the size or thickness of the ice cubes. You are stuck with one size. I’ve not seen any complaints about smelly or stale ice. If your ice has an unpleasant smell, you need to clean the ice maker. Check the manual for instructions. If it’s the first batch that has an unusual smell, that’s normal. The manual recommends throwing out all ice cubes made in the first three hours. The manufacturer also recommends using an in-line filter. This ensures that minerals and impurities in water do not affect the quality of ice. The only challenging bit is installation which is why it’s a good idea to have a plumber do it. You need to set up a water line, ideally with an in-line filter installed. You also need to set up the drainage. This ice machine comes with everything you need including a gravity drain hose, a water hose, and an ice scoop. Once the plumber has set everything up, you just need to turn on the switch to ICE, and the machine will get to work immediately. The ice comes out in sheets that are easy to break apart. Once the storage bin fills up, the ice maker automatically stops making more ice until you empty the bin. Maintenance is easy. You just need to clean the ice maker every once in a while. The manual has clear cleaning and maintenance instructions. Many verified owners of this ice maker love it not just because it makes plenty of ice, but also for the ice quality and ease of use. One feature that customers point out is the ability to lift the entire bin and dump the ice into a cooler, freezer or container. You don’t have to bend down to scoop it out. The only issue I’ve seen is from customers who cannot use the gravity drain. The company does not say which pump you should use in case you drain is above grade. If you have the same problem, call their customer support. They’ll tell you where to get a compatible pump. This is an excellent buy if you own a restaurant or bar. It’s also ideal if you are looking for a high-capacity clear ice machine for your home or office. For a gourmet ice machine of its capacity, the $900 price tag is a fine bargain. 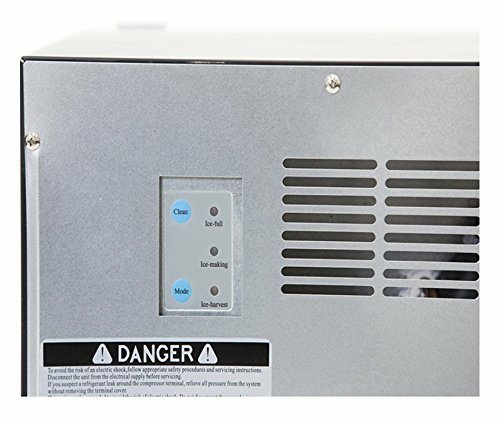 The Whynter UIM-502SS is a good choice if you are looking for an affordable commercial-grade ice maker for your restaurant, bar or office. It’s easy to use, even easier to maintain and from what hundreds of owners say, it lasts long without any major issues.